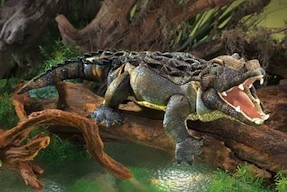 Folkmanis 2921 - Our big cuddly AMERICAN ALLIGATOR PUPPET will swamp you with affection! This realistically rendered puppet, with velour ruching on his body and soft plastic teeth, crouches at the riverbank ready to make a splash in your home! Movable mouth. Measures 31" x 12" x 6".